Chou Chou! 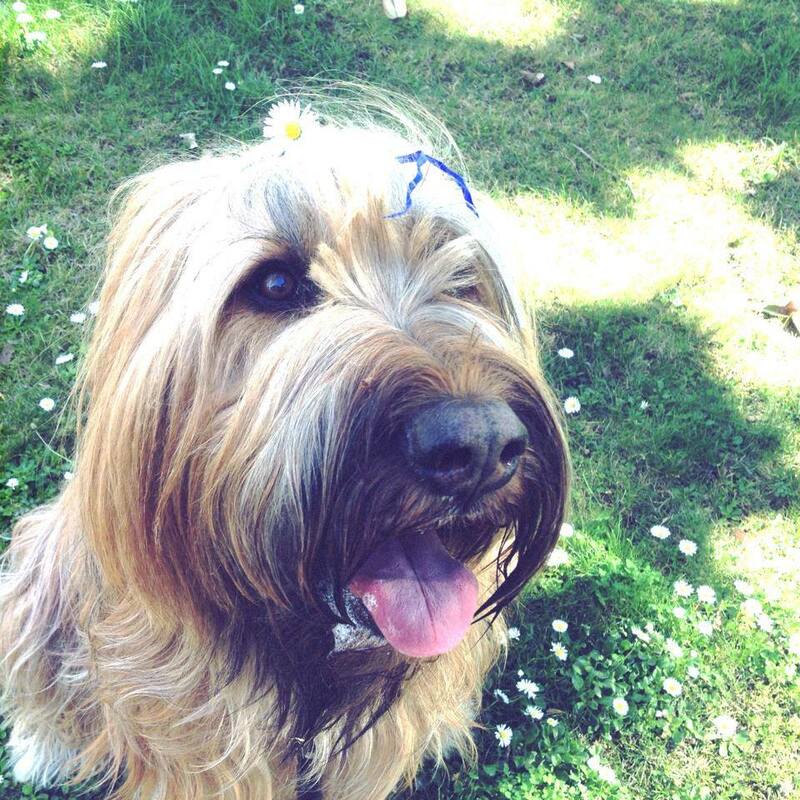 Adventures of a Briard Girl : Chou Chou! Playing in the Schoolyard! Chou Chou hasn't been back to the schoolyard to play with other dogs since she was attacked last year. Today was her first day, free to play there. But would all the dogs play nicely? Chou Chou had no fear. But I did! It had been terrifying for me to watch the Rhodesian ridgeback biting her last spring and not be able to protect her, to get that dog off of her (someone helped, but the vicious dog's owner did nothing at all). The wounds on her face -- so close to her eye! -- healed, but she went into a depression and wouldn't get out of her bed all day. And she became very frightened of even small noises that never bothered her before, like paper rattling. She began treatments with a behavioral veterinarian, and took Prozac. The medication gave me my happy, playful puppy back, and over many months, her fears went away. She's newly tapered off Prozac and doing great! It's my turn to stop being fearful. So today she went to play at the schoolyard with Toffee. She ran in, unafraid. And Toffee ran to her, glad to see her. They ran side by side, just like they used to do. There was a 6 month old giant schnauzer puppy there, too, and Chou Chou ran with him, her tail wagging, so happy. Then a 5 year old catahoula came into the schoolyard, and she played with that dog, too -- running, chasing balls, circling, trying to herd each of them, with a time out to jump up and drink at the water fountain. She played for 40 minutes, bouncy and joyful. The other dogs started to leave. It was getting late. So we said goodbye and went home. That's when I noticed her limping. I felt her left paw to see if there was a burr or something caught between her toes. No. I checked her claws to see if any were broken. No. I put her in the car and drove her to the vet. It was after hours, so it would be an emergency fee and we'd have to wait a while to see the vet. But she was limping, and I had to check it! The vet looked at her pad and found a wound on her left paw. Maybe she scraped her toe pad on the blacktop basketball court in the schoolyard, or stepped on a rock and gouged her pad. The vet told me it was a painful, tender wound, but I was very relieved it was a minor injury. The vet prescribed an antibiotic gel and we went home.